Paper written for the centennial of the Bauhaus School for a special issue of a magazine series for the Bauhaus Association (In Germany). They changed the title to "Why we Need so Much More Than the Bauhaus" and made mine the first article, but not listed in the list of "Contributions by" on the cover, not in the "Contributors" Photos and biographies list at the start of the magazine, and not in the Table of Contents. Very creative of them. Norman, D. (2018). Why we Need so Much More Than the Bauhaus". bauhaus now, 1(1), 18-21. The Bauhaus movement in Germany, roughly 1919-1933, marked a major turning point for design and its role in society. It exerted a powerful and influential role in the development of artist style. But today, for many designers, it is more of a historical curiosity than a role model. Why? What has changed? The Bauhaus grew out of crafts and the fine arts. Its focus was style and form. Although it had a huge amount of influence, today that influence is muted by the heavy artistic emphasis. There was little emphasis upon the people for whom the objects were being designed, no discussion about practicality or everyday usage. Even in architecture, the emphasis was form, not the people who had to suffer living and working in the clean, sterile environment that the architects championed. The Bauhaus movement provides an interesting paradox. Although it had a great cultural impact upon design as art, it failed to produce any single object that changed people's lives in any fundamental way. Why didn't the Bauhaus rethink the nature of things, of the way that products impact people's lives and activities? Today, designers relish the opportunity to invent entirely new ways of working, playing, and living. Instead, at the Bauhaus, the emphasis was on simplicity, which is fine as long as one is designing simple things, such as kitchen tools, tableware, and jewelry. But the world is complex, so too must be the things that enable us to work within this world (Norman, 2010). Complexity is a fact of life. Simplicity, on the other hand, is in the mind - it is the designer's task to make the complex understandable and usable. And when a complex thing is easy to understand, we call it "simple." The Bauhaus was not interested in these issues. Instead, they focused on things that fit the craft style of design. They did work with simple electronic devices - simple radios, for example - but they never addressed the question of how design could transform truly complicated devices into understandable ones. That is today's challenge. Making beautiful objects is relatively easy compared to the design challenge of making complicated objects understandable. 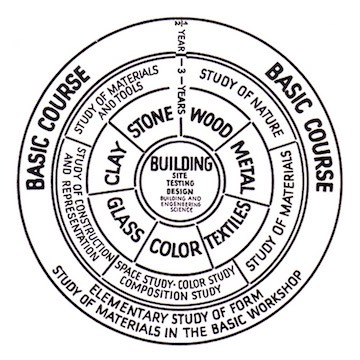 Consider the "Curriculum Wheel" (Figure 1), developed by Walter Gropius in 1922 (Bauhaus-archiv museum für gestaltun). It contains three years of study, starting with form and materials, moving to advanced topics in materials, composition, and construction. Never a mention of people. Never a mention of usage. It was all about form. Figure 1**. The Bauhaus Curriculum Wheel. ** Introduced by Walter Gropius in 1922. Note the absence of people, how things were used, how things were to be understood. During the period of the Bauhaus, all sorts of new devices for home and office were being introduced: phonographs, radios, the telephone, the typewriter, vacuum cleaners, and clothes washing machines. Refrigerators and new forms of stoves. Did Bauhaus think of these things or new designs for them? Nope. What do we need today? We need a design that moves us away from appearance and focuses upon people's activities and their underlying needs. Do we still need attractive things? Of course, but that is only one of many dimensions we need to consider. Today, we focus upon the people who use our products. We watch them, interview them, test out our ideas on them. Sometimes we co-design with them. This was unthinkable to those in the Bauhaus. As we put the person into the design, especially as we are concerned about people's abilities to understand and make use of our ever-more complex, electronically mediated objects, we need very different design principles. Form alone will no longer suffice. We must understand people, how they work and behave and, especially, how they can come to understand complex technology. It is the role of the designer to make the complex appear to be simple. The field of design has made numerous advances since the time of the Bauhaus. Design now has many different specialties, including areas quite distinct from the considerations of those earlier times: interaction design, User Interface Design, User Experience - all of these are novel. I consider myself a Cognitive Designer, a concept I suspect I would have found difficult to explain then. Design has become a critically important part of the creation and development of products. Concepts such as affordances, signifiers, constraints, and mental models were not in the Bauhaus vocabulary. The notion that it might be necessary to go out in the world and observe intended users of the designs for weeks would not only never have occurred to them, I suspect it would have been repugnant. These concepts are not difficult to understand, so the lack of appreciation was not for the lack of the vocabulary: it was because all of these concepts focus upon people's activities and the way they use and understand products. I see little evidence that the Bauhaus movement was concerned with these things. We live today in a very different world, even if it is only a bit less than 100 years later. The things that concern us are not the things that concerned the members of the Bauhaus. What is the Bauhaus noted for today? Form. Style. The emphasis on simplicity of appearance. The Wikipedia article on Bauhaus states "One of the most important contributions of the Bauhaus is in the field of modern furniture design" (Wikipedia contributors, 2017, August 23). The world of design today is far larger than the design of furniture. The Bauhaus movement did elevate the practice of design from an obscure profession to the high and mighty realm of art. That probably had great impact on the modern ascent of design to its place today as a powerful force in industry. Today, designers aspire to more than the creation of objects. Design is a way of thinking, so it can be applied to any aspect of a company, any aspect of society. The designers' approach to discovering and solving the core, root issues with creativity and relevance can be applied to most issues in the world, whether it be healthcare or education, transportation or entertainment. To the Bauhaus, design was an applied form of art, an approach that I believe to be fundamentally wrong. It is what creates a misleading impression that designers make beautiful objects. Design is a way of thinking, about addressing the fundamental needs of people and society. It can be applied to all aspects of human and societal life. Some things that we design do not have a physical structure: art, materials, form have little or no relevance. When the things that we design are tangible or visible, then yes, form matters. However, even here, I would place form second to utility: designers make things for people to use. They must be understandable, usable, emotionally delightful. For me, appearance Is extremely important, but secondary to utility. The great designers know how to make delightful, beautiful objects that are also functional, understandable, usable. That is what 21st century design should be. That is what it must be in this age of ever-more complex technology that, without the aid of designers, would be unintelligible, frustrating and a danger to society. Design can address the critical problems of our age. The Bauhaus movement was of great historical importance. Today, we need more. Aristotle is considered one of the forerunners of the scientific movement, even as his actual words and writings of science and technology are completely ignored by today's working scientists. That is how I feel about the Bauhaus movement: I am grateful for what it accomplished, but I do not find it relevant to the complex issues we face today.